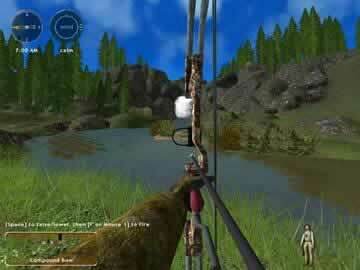 Hunting Unlimited 2010 Game Review - Download and Play Free Version! Create an Extreme Hunting Experience! Bring the wild game of North America, Canada and the Bavarian Forest to your computer and hunt all year round! Enjoy the thrill of sneaking through forests, battling icy landscapes and more as you pursue the wildest game out there any time, any day. Track 18 of the most prized animals like red deer, mountain lions, moose and more, plus some of the fiercest animals on Earth including lions, jaguars and bears! Choose from 11 challenging locations in the United States, Canada and, new to this version, the Bavarian Forest. Hunt Anything in Any Environment You Want! Choose from more than 32 extreme weapons like shotguns, rifles, crossbows and more and also buy binoculars, scents, decoys and more, then head into the great outdoors for your ultimate hunting adventure! Hunt however you want and explore and use the terrains to your best abilities. Play more than 110 missions involving the most challenging habitats and game or play Free Hunt mode to hunt freely on any map. Practice at the Target Range before heading out or design your own missions with the Mission Editor to challenge yourself. 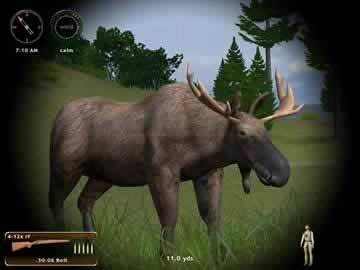 This realistic game will get you prepared for hunting season and keep your eyes and shooting sharp all year round. Enjoy exotic hunting trips with game you'll never experience tracking or customize hunting trips a little closer to home to plan real hunting expeditions. This game will challenge you and build your skills in any ways you choose! Enter a hunting paradise now and challenge yourself with Hunting Unlimited 2010! Hunting Unlimited 2010 is a thrilling hunting game that will having you hunting down everything from deadly bears to harmless turkeys. There are a host of locations to hunt in, ranging from the South Central Plains to the Pacific Northwest. Several tutorial missions teach you the basic controls, as well as some hunting tips and techniques. The different modes let you just right into the action, hone your skills, create your own missions, or setup your own hunts. A bullet cam lets you watch your shots in slow motion as you take down animals. This game provides an excellent hunting experience. To start hunting, you'll need a hunter profile. You can create a hunter profile that lets you set your hunter's name, as well as adjust their look. Once you've setup your hunter, you select the mode you want to play and any options for that mode. You can then begin your hunting trip. Depending on the mode, you may be thrown right into the action or have to do a bit of tracking and work to find your prey. The mode will also determine what type of animals you can catch. Hunting Unlimited 2010 contains a variety of levels in which you can hunt. These levels are locations all over the world that differ significantly from one another. They are also fairly large and detailed. There are lakes, rivers, trees, grass, and more to add to the realism and make you feel like you're really there. The locations include Alaska, the Bavarian Forest, Africa, the Southern Rockies, and more. There are eleven locations in total to choose from. The locations add of lot of variety to the game and each one feels unique when hunting. There are also several different modes to choose from when playing the game. The Challenges mode contains several tutorials that teach you everything from the basic controls to advanced hunting tactics. This mode also contains missions (more than 100 in total) that often put you right into the action. Some have you face off against dangerous animals like bears or wild hogs, while others have you hunting down docile deer or turkeys. There's a lot to do, and your performance on these missions determines your score. Better scores unlocks more missions to play that are even more challenging. In addition to Challenges mode, there is a Free Hunt mode that lets you select a location, the type and number of animals in that location, and begin hunting without any time limit or goals. A Target Range mode lets you practice shooting and perfect your aim. You can even create your own missions in the User Missions mode. If all of that wasn't enough, there's a Tournament mode where you can play tournaments downloaded from the web. This game provides a ton of choice that lets you create the perfect hunting experience. The controls in the game are fairly straightforward and easy to use (especially after playing through the tutorials). Hunting Unlimited 2010 plays very much like other FPS games, using the WASD keys to move and the mouse to aim and fire. The only issue when it comes to controls is when looking around/aiming. A tiny move of the mouse can cause a big jump in your view. You can adjust mouse sensitivity downwards to reduce the occurrence, but it can be annoying. Another drawback to the game is the presentation. The graphics aren't terrible, but don't quite match up with other similar games either. The animals only have a handful of animations that they perform that sometimes don't seem to fit. For example, you may shoot a running animal and kill it instantly, but the animal just stops and falls over to the side. Wounded animals don't really run or move any different than unwounded ones. It can take away from the feeling like you're on a real hunt. There's music included, which really doesn't affect the game one way or the other. There are little quips and lines from your hunter throughout the game that are a nice touch at first but quickly become annoying. One positive from the presentation is the bullet cam in the game. The bullet cam lets you follow your shots in slow motion toward their target. You can turn this on only for promising shots, all shots, or turn it off if you wish. It's a fun feature that makes the perfect shots even better. 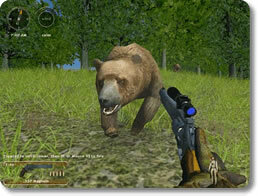 Overall, Hunting Unlimited 2010 is a great choice for anyone looking for a hunting game. If you have a previous version of Hunting Unlimited (such as Hunting Unlimited 2009), you might not find enough changes or additions to make this worth buying. For everyone else, this game has a lot to enjoy, and newer players will find that the tutorial extremely helpful in getting started. There are a ton of maps, animals, and weapons in this game that add a lot of variety to the play and make each hunt feel different and unique. There a few issues you might run across that take away from the gameplay and realism, such as the dumb animal behavior and presentation quality. However, this is still one of the better hunting games available and certainly worth playing for anyone interested in hunting. Watch a few hunts that you can take part of in Hunting Unlimited 2010.